Benefits of Floating Aquatic Plants - Aquascape, Inc. Floating aquatic plants can be a very effective way of adding filtration and surface coverage to a water garden. Since these are free-floating plants (having no roots anchored in soil), they draw 100 percent of their nutrients directly from the water, feeding on nutrients that would otherwise feed algae. Floating plants can be placed in the pond, but need to be situated out of the reach of the skimmer. Tucking floaters into the edges of the pond, or in and around lily pads, can help prevent the skimmer from drawing them in. Examples of floating plants that are heavy feeders include water hyacinth and water lettuce. 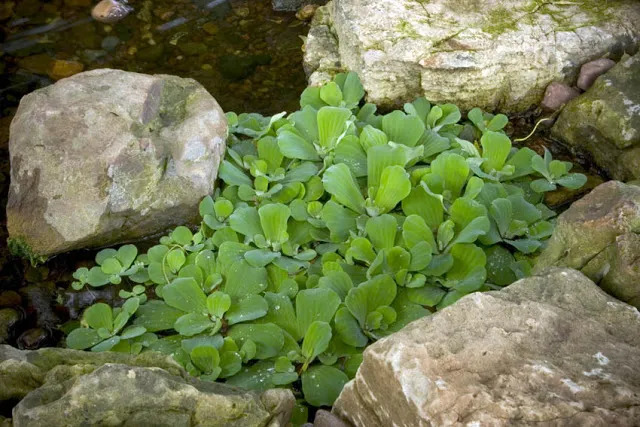 These plants are great at helping a water gardener naturally discourage and starve algae, keeping the pond from turning green. The floaters also help by providing some shade, which in addition to helping to prevent algae growth, also benefit the fish in the pond. Depriving algae of necessary sunshine is the best cure for a green pond. Caring for floating plants is very simple. Keep them thinned back during the growing season and in northern climates, remove them from the pond in the fall to prepare for winter. For ponds with skimmers, it’s best to place floating plants in an area where they will not end up in the skimmer, blocking its opening. A good place to keep them is in the top of the biological filter, where all the nutrient-rich water will pass over their roots. It also helps to hide the opening to the filter. While floating plants can be beneficial, some can become aggressive because of their ability to absorb nutrients so well. It’s easy to remove extra unwanted plants in order to prevent an ecological takeover. Since there is no root system, it’s a matter of simply pulling out the unwanted plants and throwing them in the compost bin. Whatever you do, do not throw the extras into any natural body of water! They can easily take over and choke out native plant materials. Because of their aggressive nature, many floaters are illegal in southern states. Before you use them in a water garden project, check with your local department of agriculture for your state’s noxious weed list. Fleshy, heart-shaped leaves growing in a 2-6” rosette. When crowded, the leaves will extend above the water surface, otherwise they lay flat on the water surface. Hardy in Zones 6-10. The most popular floater with its succulent leaves and bright purple flowers – great at competing with algae for nutrients and light. It is illegal in many states due to its aggressive growth habit. Hardy in Zones 9-11. Large, light green leaves growing in a rosette that resembles a head of lettuce. Does best in part shade, but can be slowly acclimated to full sun. It may sunburn in some parts of the country. Hardy in Zones 9-11.